What does Canadian tuxedo mean? The slang term Canadian tuxedo refers to an outfit pairing jeans with a denim jacket. A Texas tuxedo can describe this pairing as well as a suit jacket worn with jeans, cowboy boots, and cowboy hat. Fashion 101: If Bella Hadid wears it, it's hot. So, it appears that the Texas tuxedo is now — or, again — a thing. While donning denim-on-denim — also known as the Canadian tuxedo — has previously been dismissed as a fashion faux pas, trendsetters like Rihanna, Miley Cyrus and Kanye West have joined countless others within and beyond the glare of the style spotlight who've embraced the ensemble. Where does Canadian tuxedo come from? Although use of Canadian and Texas tuxedo emerged in the 1990s and 2000s, the origin of the Canadian tuxedo itself is the subject of much speculation. One story goes that singer Bing Crosby was kicked out of a Canadian hotel in 1951 for wearing a denim-on-denim outfit rather than formal wear. Blue jeans pioneer Levi Strauss, in response, sent Crosby a custom-made denim tuxedo jacket. The oft-repeated, if dubious, tale may have connected double denim, Canada, and tuxedos in the popular imagination. Another account says Canadian tuxedo mocks the denim jackets and jeans stereotypically worn together by western Canadians. Calling the outfit a Texas tuxedo is based on similar stereotypes, with the particular combination of jeans, sport jacket, and cowboy boots/hat based on Texas oilmen. The 2001 comedy movie Super Troopers makes fun of a “Denim Dan” as “president, chairman, and CEO of Levi Strauss” for his “Canadian tuxedo.” Many articles written during the inauguration of President George W. Bush, a Texan, in 2001 mentioned his guest bringing the Texas or Western tuxedo to Washington. In a 2017 book, a Detroit Red Wings ice hockey player remembers being knocked by a team mate for his Canadian tuxedo in 1999. The Canadian tuxedo has been considered unfashionable or at best, peculiar. Describing someone’s outfit as a Canadian tuxedo is often done as an insult, but may also be in good-natured jest. 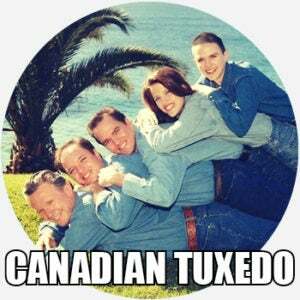 Canadian people may also use the phrase in a self-deprecating way, while Texans may describe their tuxedo with an unabashed pride. Still, be mindful that calling someone’s outfit a Canadian, Texas, or Western tuxedo could offend their national, regional, or cultural identity.